The LEOFF 1 Coalition supports and will continue to fight for the rights of adopted children of disabled retired Law Enforcement Officers and Firefighters to ensure that they receive the same benefits as children naturally born after retirement. Katharin S. Boreen is a member of the LEOFF 1 Coalition. Click here to watch her testimony. Click here to read the RCW definitions for "child"
Click here to read her letter of appeal. Honorary Board Member Congressman Dave Reichert Retired Sheriff of King County Joins the Leoff1Coalition! It is important to point out that pension checks are not paid from the general fund. Each pay period, school employees contribute to their retirement accounts and the state makes a matching contribution. This money is invested over the course of an employee's career. Click Leoff1 or Teachers Retirement System (TRS) Plan 1 for more details. Click here for a PDF version of the cutoff calendar. February 5, 2016 Last day to read in committee reports (pass bills out of committee and read them into the record on the floor) in house of origin, except House fiscal committees and Senate Ways & Means and Transportation committees. February 9, 2016 Last day to read in committee reports (pass bills out of committee and read them into the record on the floor) from House fiscal committees and Senate Ways & Means and Transportation committees in house of origin. February 17, 2016 Last day to consider (pass) bills in house of origin (5 p.m.). February 26, 2016 Last day to read in committee reports (pass bills out of committee and read them into the record on the floor) from opposite house, except House fiscal committees and Senate Ways & Means and Transportation committees. February 29, 2016 Last day to read in opposite house committee reports (pass bills out of committee and read them into the record on the floor) from House fiscal committees and Senate Ways & Means and Transportation committees. March 4, 2016* Last day to consider (pass) opposite house bills (5 p.m.) (except initiatives and alternatives to initiatives, budgets and matters necessary to implement budgets, differences between the houses, and matters incident to the interim and closing of the session). March 10, 2016 Last day allowed for regular session under state constitution. * After the 54th day, only initiatives, alternatives to initiatives, budgets and matters necessary to implement budgets, matters that affect state revenue, messages pertaining to amendments, differences between the houses, and matters incident to the interim and closing of the session may be considered. Legislators are still working on the budget. The talk is that the 2nd special session will last until June 12th. Since the last revenue forecast, legislators have more money than was first expected. Today the state House and Senate will vote on very different budget plans at the same time, The debate is likely to stretch into the evening. Then, many legislators will be taking off tonight to go home for an Easter break. They will return Monday to continue work on the State Budget. It is expected that the House Democrats’ budget to pass the House and the Senate Republicans’ budget to pass the Senate. After each budget passes, the House, the Senate, and the Governor's office will begin to negotiate a compromise budget. Regular session ends April 26. Click Here to Read Amendment! ESB 5873, which stands for: “Engrossed Senate Bill”. LEOFF I members, please call the House Appropriations Committee members and ask them to please to vote YES on our bill, ESB 5873 - 2015-16 . 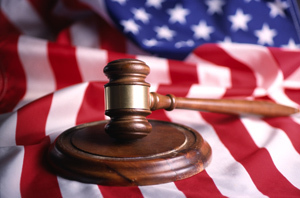 Click here to see how a bill becomes a law. SB 5873 is in the House - Mar 10 First reading, referred to Appropriations (Not Officially read and referred until adoption of Introduction report). Click here for bill history! Senate Bill 5873 has been sent to the floor of the senate and placed on the floor calendar for a second reading. Click here to see how a bill becomes a law. Right now SB 5873 is at step #5. Watch Testimonies for SB 5873 Here! Make a comment on the bill here! Permitting persons retired from the law enforcement officers' and firefighters' retirement system plan 1 to select a survivor benefit option. SB 5873 — Creates another opportunity for LEOFF 1 retirees to designate a survivor beneficiary. If enacted, this bill would create a one-time window for LEOFF 1 retirees who did not previously designate a post-retirement spouse as a survivor beneficiary, another opportunity to do so. To qualify, the member must have been married to that spouse for at least two years prior to September 1, 2015. Click here to read about SB 5873. SB 5873 will not cost the State of Washington anything. LEOFF I is fully funded. LEOFF I Coalition does not support any type of merger with any retirement plan including LEOFF 2. Please contact legislators in the Senate Ways & Means Committee and ask them to support SB 5873. Click here to contact committee members. Check Your LEOFF I Web Site Daily! Special session started May 13 to June 12. SB 5916 passed through the Senate Ways and Means Committee, and is now in Rules. Click here to view Rules Committee members; you will find their names, emails and phone numbers listed. As you are probably aware the legislature failed to finish it's business in the allotted 105 days. The general operating budget and capital budget still need to be passed. The majority party in the House wants to increase your tax bill to the tune of $1 Billion with their version of the budget. This is NOT A RESPONSIBLE BUDGET and a job killer for your children and grandchildren. Please continue to speak out against it and fight for a responsible budget. The state will be taking in $2 billion over the next biennium from economic growth and not raising taxes. We can fully fund education, protect the vulnerable, and fund public safety without stifling this fragile economy with higher taxes. We will be going into special session on May 13th to address these issues. Call the Legislators and tell them what you think! SB 5916 is a BAD BILL! and urge legislators to vote NO! LEOFF I Members, We need to protect our benefits NOW!! If this bill passes, it will BREAK Federal and State law. Below are a list of articles that were recently published regarding the LEOFF I. Please note that this was all dealt with by the stake holders years ago. The COLA for 2013 is estimated at 2.54% according to DRS. Click here to visit the website. (LEOFF 2 wants to merge with LEOFF I’s pension fund to have all the money from both pension systems). LEOFF I Coalition is a statewide organization with a great number of surviving beneficiaries. 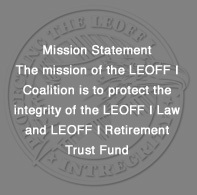 The mission of LEOFF I Coalition is to protect the integrity of LEOFF I law and retirement trust fund. This is an appeal to Washington State Legislators Please vote NO on merger bills, Merging plan 1 and plan 2 of the law enforcement officers’ and firefighters’ retirement system. Who are the LEOFF I members and why do they oppose the merger? LEOFF I members are older, retired law enforcement officers and fire fighters. As older citizens, many members struggle to cope with ailments and disabilities that have developed because of their many years of public service. As a result, they depend on their pension benefits to help keep them healthy and mobile. This hardship extends to both the cities and counties. Currently they cannot afford to maintain the public servants that we depend on so greatly. If merger bills pass, we will have even less resources to keep law enforcement and firefighters in your legislative district employed and protecting you. Simply put: Our financial security, community and personal safety depend on merger bills not passing! Please vote NO on merger bills. If any merger bills pass, the LEOFF 2 Board of Trustees would have control of all LEOFF I and LEOFF 2 pension money. If any mergers pass, you will be pitting active law enforcement officers and fire fighters against retired members. Please do not open this door. LEOFF I members want their pension responsibility to be governed by elected legislators. Handing power over to LEOFF 2 would be a conflict of interest. A promise made should be a promise kept! Protect our pension fund. We owe a debt of gratitude to the members of LEOFF I, family and friends. Thank you for all your emails, letter writing, and phone calls to stop SB 6563 and HB 2350 from passing this year. Thank you for your hard work and dedication. Merging plan 1 and plan 2 of the law enforcement officers' and firefighters' retirement system, SB 6563, HB 2350., were introduced on April 11, 2012, the last day of the 2nd special session of the 2012 Legislative Session. Senator Ed Murray (D), Chair. Click here. Senator Lisa Brown (D). Click here. Senator Craig Pridemore (D) Click here. Senator Jeanne Kohl-Welles (D) Click here. Senator Maralyn Chase (D) Click here. Senator Paull Shin (D) Click here. Senator Steve Conway (D) Click here. Senator Nick Harper (D) Click here. Senator Steve Hobbs (D) Click here. Representative Pat Sullivan (D) Click here. Representative Kevin Van De Wege (D) Click here. The Olympian: Battle over merger of state pension funds unresolved. LEOFF 1 and LEOFF 2. Click here to read more and to listen to the interview. Click here to read more about SB 6563. 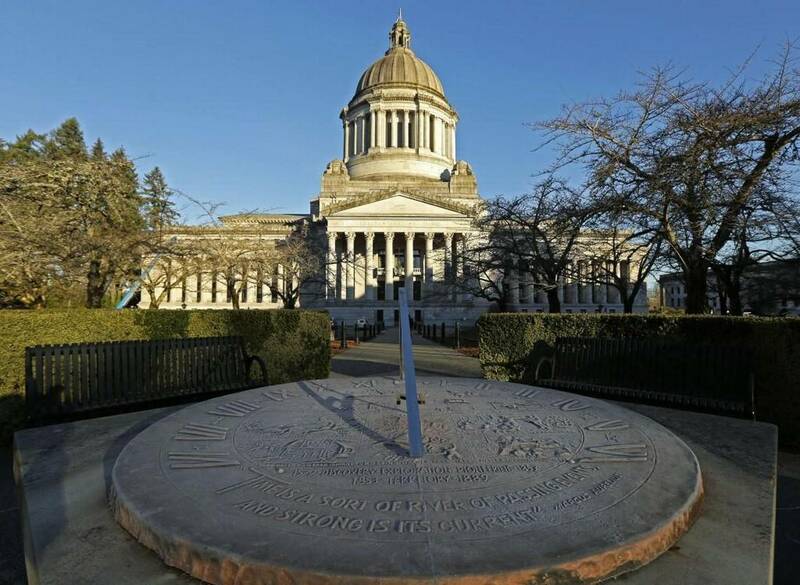 Deadline expires at midnight, no budget deal in Olympia yet. As of April 9, 2012 the LEOFF I Merger is not in the state budget. Governor Gregoire has been meeting with leadership and budget writers working out the last details, hoping to leave town by April 10, 2012 by midnight. Please write letters, email or call on how SENATE BILL 6563 will impact you. With your help we can kill the bill. - the Senate Committee members of the Ways and Means. (Please note that file is large. to balance the State budget! Watch for Bad Legislature Bills —Check Often! Look under the submenu titled "Inside the Legislature". The first star is "Find your local Legislator", click and enter your address and zip code.